Chief John Hinton has announced the Cardington Police Department is teaming up with the Morrow County American Red Cross to collect items for Military Care Packages. Below is a list of items that they will be collecting from July 15 until September 30. If you wish to donate any of the items listed below you may drop the items off at the Cardington Police Department located at 215 Park Avenue, Cardington. – Powdered drink mix. Service members will appreciate anything that can be mixed with water. – Meal enhancers. Anything that can be mixed with MREs (Meals Ready to Eat), such as ramen noodles, seasoned salt, individual packets of hot sauce, mustard, relish, and ketchup. – Quick protein. Energy bars, tuna fish, sardines, non-perishable beef jerky, or beef summer sausage. Make sure the meat is labeled USDA Beef. – Snacks. Look for small, hard containers of chips, pretzels, and nuts. These are easier to carry than large containers. Avoid bags, which may burst under high pressure. 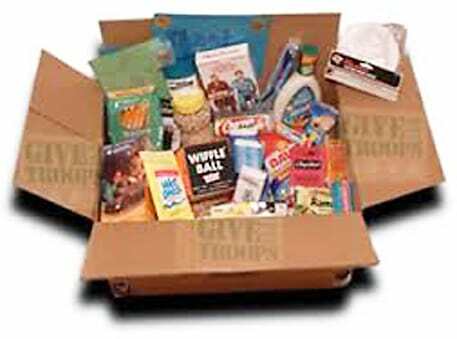 If you do send large bags or containers, include small zipper-lock bags so service members can pack smaller amounts of snacks to carry. Snack cakes, cheese crackers, and cookies are in high demand. Salty snacks are good for those deployed in the desert, especially in the summer months, because they will encourage service members to drink more water. – Candy and gum. Please avoid chocolate as it will more than likely melt. Gum and other types of candy may soften and become gooey, so send these in plastic zipper-lock bags. Send plenty of extras for service members to share, especially if he or she comes into contact with children. Choose small, travel-size containers of personal care products, and avoid aerosol cans. To keep liquids from spilling, cover the opening of the container with plastic wrap, and then recap before shipping. – Toiletries. Toothbrush, toothpaste, dental floss, cotton swabs, shaving lotion, disposable razors, shampoo, individually packaged tissues. – Personal care. Individually packaged baby wipes, eye drops, lip balm, lotion, aspirin or other pain reliever, feminine hygiene products for women. – Foot care. Moleskin, medicated foot powder, athlete’s foot ointment. – Goggle-style sunglasses. Service members will appreciate these if he or she is deployed in the desert. – Cotton socks and underwear.Make sure the garments are made of 100 percent cotton rather than a cotton blend. – Reading material. Paperback books, current magazines, comic books. – Word games and puzzles. Crossword puzzles, word searches, jigsaw puzzles. – Games. Foam footballs and basketballs, Frisbees, Hacky Sacks, playing cards, yo-yos. – Electronics. Portable DVD player, CD player, DVDs, CDs, handheld electronic games. – Batteries. Size AA and D batteries are in high demand. If you’re sending a battery-operated device, such as a CD player, remove the batteries so the appliance doesn’t accidentally turn on during shipment. – Writing material. Notepaper, envelopes, pens, pencils, and stamps. – Phone cards. Shop around to get the best deal on overseas minutes. We will not accept obscene material, alcohol or any unauthorized political materials.